Vishnu Vishal, Mia George starred Indru Netru Naalai is in post-production stage. Currently, Vishnu Vishal and team are dubbing for their portions in the movie. 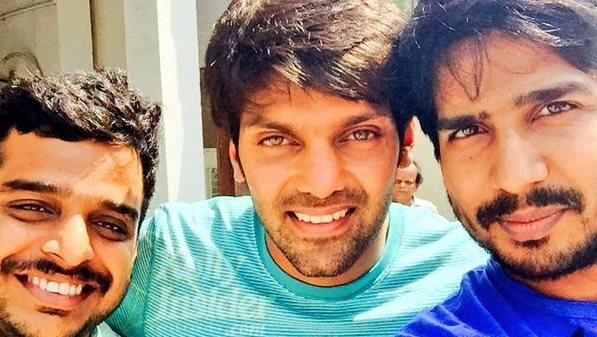 Arya, who has played a cameo role in Ravikumar directed Indru Netru Naali also dubbed for his portions in the movie today. Apparently, Vishnu Vishal took the news to Twitter and shared, "Thnx a lot @arya_offl for ur cameo in INDRU NETRU NAALAI :) n finding tym 2 finish dubbin ..wid drctr @Ravikumar_Tup"
Indru Netru Naalai is the joint production venture of CV Kumar's Thirukumaran Entertainments and KE Gnanavelraja's Studio Green. Karunakaran, Jayaprakash and Anupama Kumar played key roles in the movie. Hip-Hop Tamizh has composed music while Leo John Paul is taking care of editing department. "Indru Netru Naalai" is an upcoming Tamil Cinema's first ever Time Travel Science Fiction comedy Thriller.